Medina Azahara. Archaeological remains of the city. Cordoba. The Caliph Abd al-Rahman III was a great promoter of culture and a skilful politician who transformed his dominions into the most prosperous lands in the West at the time, comparable only with Baghdad and Byzantium. 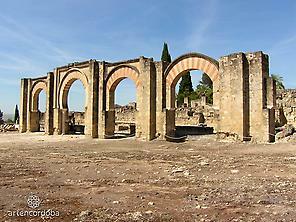 The city of Medina Azahara has a practically rectangular floor plan. It was built on raked terraces which made use of the slope of the mountainside. Each terrace was separated from the others by walls, which divided the city into three parts. The Alcázar Real palace is located on the highest and intermediate levels, while the lower part stood outside the walls and was used for dwellings and the mosque. There are still remnants of tiled borders, paintings and columns in the composite and Corinthian styles. Visitors should not miss a visit to the two recently restored rooms. It was declared a National Monument in 1923. 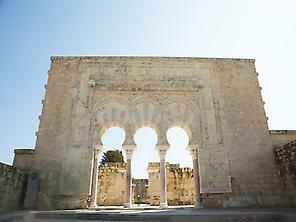 To conclude the visit, the archaeological site also has a visitor centre which serves as a starting point for the tour. The centre is located underground in the style of an archaeological site, and features a collection of exhibits from the most important periods in the history of Medina Azahara. The tour of the visitor centre lasts about one hour and includes audiovisual shows, and continues with a visit to the archaeological site (which can be reached by bus from the same building). Closed: 1, 6 January, 1 May, 24,25,31 December.